If you’re expecting scones with jam and cream, and cucumber and cheese sandwiches, then this isn’t the place for you. But, if you’re open to trying something exciting, different and new, then definitely give this a go! 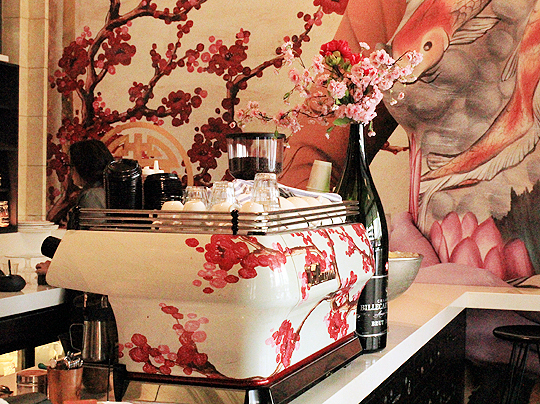 The Madame Hanoi Hendricks High Tea isn’t your traditional high tea. If you’re expecting scones with jam and cream, and cucumber and cheese sandwiches, then this isn’t the place for you. 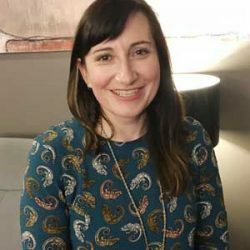 But, if you’re open to trying something exciting, different and new, then definitely give this a go! Madame Hanoi is just over six months old, and is located on North Terrace next to the Adelaide Casino as part of their complex. It’s a French Vietnamese Expresso Bar and Bistro started by internationally acclaimed celebrity Chef Nicholas Watt. After traveling to Vietnam on his honeymoon, Nic was drawn to the French influenced food and culture. His hope for the new venture is to capture the tastes and flavours that can be found on the streets of Hanoi. Hanoi was chosen by the French colonialists to be the capital of all Indochina from 1902 to 1953, which resulted in the food in the region being influenced by France. 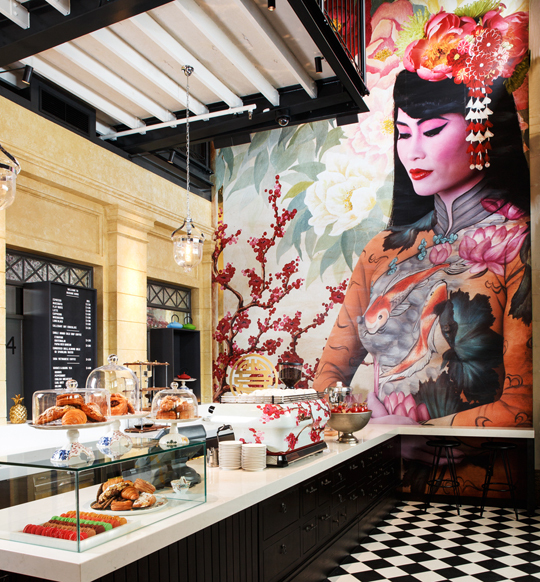 The décor is welcoming and striking with a large mural (8 metres high) of Madame Hanoi on the far wall spread over two storeys, which was done in collaboration with Body Artist and Adelaide girl, Emma Hack. 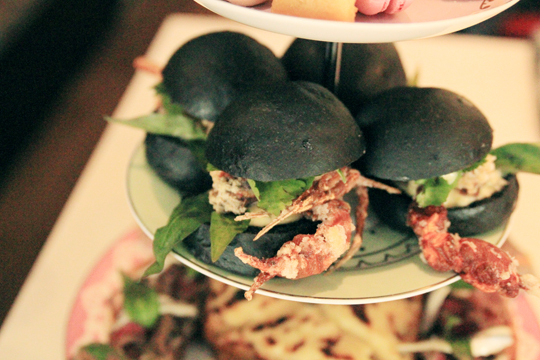 The main focus of the Madame Hanoi Hendricks High Tea is savoury rather than sweet. 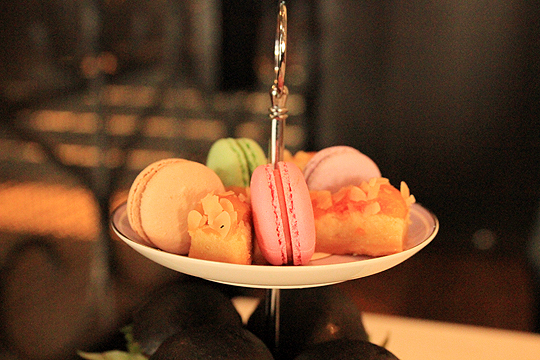 The sweets make up a tiny portion of the high tea. The French inspired Croque Monsieur is glazed ham, Emmental cheese and toasted sourdough. The sweetness of the glaze and the generous helping of cheese was an excellent combination. I could have easily eaten an entire sandwich of this. The Tartine Bo Tai is Piquant rare beef, with white anchovy and fragrant mint on crispy bread is definitely an acquired taste, but it did keep with the Vietnamese French colonial history though. Banh Cua Lot is on their daily menu as one of the most popular dishes at Madame Hanoi. It’s known by the locals as the Spider Roll with soft shell crab, a black brioche bun, coriander and chilli lime mayonnaise. Don’t be afraid of the crab’s legs like myself, just tuck them in the bun and enjoy! The sweetness of the bun and the mayonnaise is really tasty with the crab. The squid ink dyed black brioche bun is a great novelty and sets off the entire dish. Goi Cuon cold rolls with confit duck, rice noodles, cucumber and mint were quite rich with the olive oil, as you would expect with Duck but had a really nice flavour and was a nice twist on the traditional cold roll. 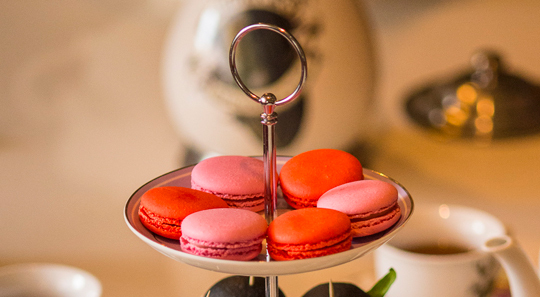 The sweet side of the Madame Hanoi High Tea consisted of a small selection of macarons. The host advised they are bought in and not made on the premises. They didn’t taste outstanding but were nice enough for a macaron. Some of the flavours available include strawberry, lime and coffee. Lemon tart was printed on the menu but we were advised that does change with each high tea. I was a bit disappointed as I’m a lemon fan, but on the day was a piece of apricot and almond slice. It had a lovely soft pastry base with fresh apricots just like my nanna used to make! The host advised us they can accommodate dietary intolerances and have some vegetarian options, with advanced notice. 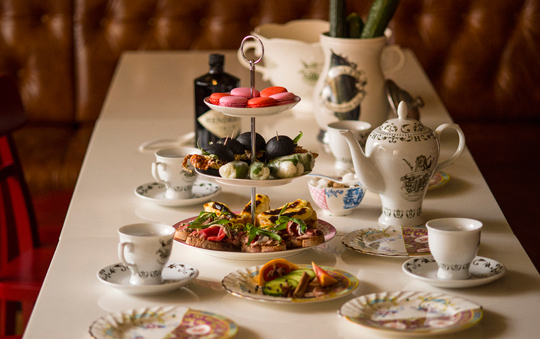 The Madame Hanoi Hendricks High Tea, had me at Gin and Tea – two of my favourite things! The signature drink and definite stand out for the high tea, is a pot of Hendricks Gin Tea with fresh lime juice, cucumber, coriander, salted and spiced honey and hot English Breakfast Tea. I’m not a fan of coriander but I tried them both and they were equally as nice as each other. The coriander wasn’t overpowering at all. It was lovely on a cold winter’s day to have this refreshing but warming tea. It was served in a lovely Hendricks teapot and teacups to match. The experience was definitely unique and not like anything I have had at a high tea before. It was a nice change to have something different. They should consider adding an additional pot of the Hendricks Gin Tea to the high tea menu, as it was delicious, a great innovation and good alternative to hot tea.